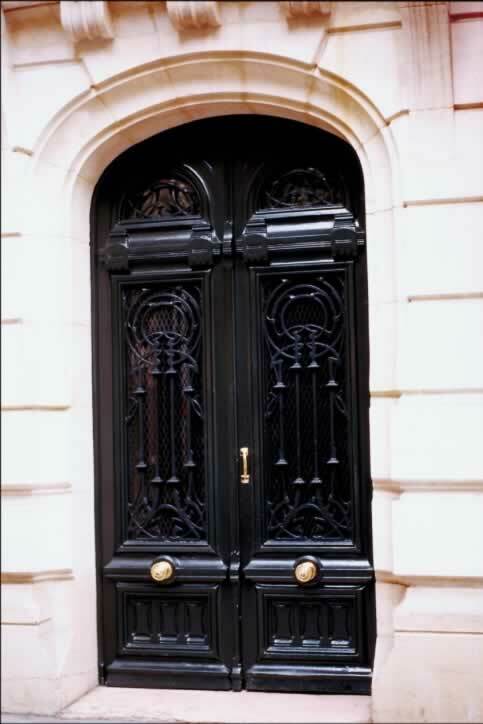 These glossy black exterior double doors greatly contrast with the creamy rock fa��ade into which they are set. The archway is elliptical in shape, and the doors are similarly shaped. Each door is comprised of three panels, and the detailing on the rails is very ornate. The rail beneath the top panel is decorated with side molding. The top panel and the center (largest) panel are both lites, another word for a door panel made of glass. The glass is very difficult to see because both panels first have a very ornate glossy black grille, and behind the grille is a fine metal grate. The bottom panels are each detailed with three rectangular recessions. The right door has a single polished brass door handle, suggesting that the left door is secured by a floor bolt. Each door has a decorative polished brass rosette.